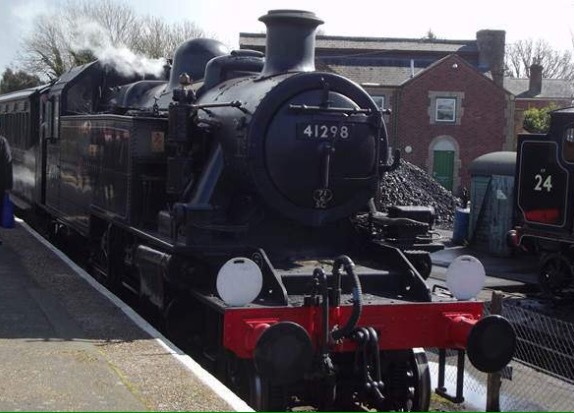 Tonight we are looking at locksands visit to the Isle of Wight railway to see the lines new Ivatt tank. I will be visit the line in June so expect a future post on the new tank engine. Back in the late 1940s and into the 1950s a small tank engine was built for use on the railways of Britain. They were effective and useful engines that worked all over the place. Maybe they were deemed common and that earned them the nickname of Micky. I recall travelling behind a Micky (more than once) on the Horsham to Brighton line. Actually I was a bit horrified by it for it purported to be an LMS engine – not native to my beloved Southern region. But at the time it would have been about a dozen years old and was more reliable and powerful than the Victorian locos it replaced. In the mid 60s there were plans to send Mickys to the Isle of Wight to replace the even old Victorian locos still in use over there. Sad to say Dr Beeching and his political masters had other ideas and closed down most of what was left of the island’s rail network. The stub of a line that was left was electrified and ancient trains from London’s tube system were taken on to the island to run that line. Click the link below to read the rest of locksands post.